First things first. You poke the CORPSE with your BRUSHERHANG. Before, you were unaware of what a BRUSHERHANG could possibly be good for. Now you know: it's good at poking! You carefully use the BRUSHERHANG to pull everything out of his POCKETS. Despite your perpetual lack of HOPE, you nevertheless HOPE for SOMETHING GOOD. Hmm. 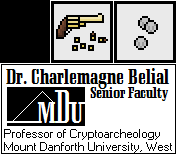 It appears the forcibly right-handed MAN was named "Charlemagne Belial." Poor fellow. Upon close inspection, it appears his HAND was cut off very shortly before he died, but the wound was not the cause of death. There are no other obvious INJURIES on the BODY. If you had to guess a cause of death... he died... of DEATH. You're not a freakin' FORENSIC INVESTIGATOR, geez. If you had to guess something specific though, you'd say he looked like he died of FRIGHT. Less than an hour ago, at that. In that light, I think consulting with MADAME NADIYA to SPEAK WITH DEAD is still a fabulous idea! --The dead guy is really dead. --Rhys has a (minimally) loaded gun available. Why would Dr. CB be carrying a single business card? Did he give his second-to-last one to Col. Ferris? Did Madam Nadiya spit out the business card for this poor sap who is not Dr. CB, because the real Dr. CB thought to do some career enhancement during his tour of the fortune machine factory? Is this a prototype card sporting the snazzy new MDU logo? ...getting off track. Must be the influence of the what-duck. My vote is that Rhys should keep the Citizen Cane equipped as his weapon. The REVOLVER (DERRINGER) obviously didn't do Dr. CB any good, meanwhile the typically phenomenon-haunted Irish favor a weapon similar to the cane. There's a correlation, if not causation. Is anything written on the back of the business card? Anything written on the back--- in blood??? Close doctor's eyes and put coins on them.